Sofitel Vienna Stephansdom boasts 182 elegant rooms and suites with views of Vienna. Why not explore St. Stephen's Cathedral, the Vienna Woods or ride the giant Ferris wheel? Marvel at the breathtaking view from the top floor of the glass-fronted Le LOFTrestaurant, bar and lounge. Experience the beauty of Vienna at night while enjoying a cool drink or feasting on unique Austrian and French dishes created by Antoine Westermann. This stylish hotel has a striking 21st century structure. The glass and steel sculpture uses light and shadow to provide an airy feel and blends seamlessly with its surroundings. A state of the art hotel for both business trips and leisure breaks. « Non –colours » that French architect Jean Nouvel calls « almost nothing » are the leitmotif of the bedrooms and the very essence of the concept. Jean Nouvel used the same colour for the floors, walls and ceilings of the guestrooms. There are rooms that are all white, all gray or all black. Minimalist and monochromatic, they redefine the contours of the traditional luxury hotel. Inside the 182 guestrooms and suites at the Sofitel Vienna Stephansdom, Jean Nouvel designed a system of sliding partitions that allows guests to select the size of the window openings which can be closed, minimal or large format. So travellers can choose an entirely personal view of Vienna. From view to touch. New sensorial components are used to form a silky, velvety surface christened Soft Touch, covering partitions, floors and ceilings. To guarantee an incomparably luxurious 5 star stay, all rooms are equipped with High speed internet connection, flat tv screen, Bose Wave Music system, Nespresso machine, separate bath and shower, Hermes toiletries in the bathrooms, and the exclusive MyBed concept bySofitel. VAT included in the rates. Babies (until 3 years): cot free of charge in all room types Children are free of charge until the age of 12 years when staying in their parent’s room. Extra beds can only be added in Luxury Rooms. Free acces to Fitness and spa area. Free use of minibar (mineral water & fruit juices). Cancellation policy depends on the rate which is booked. Crowning the Sofitel Vienna Stephansdom is its ultimate feature, the 18th floor, walled in only by glass, ever-exposed to the constantly changing light. Floating above the city and colored by a painted mural ceiling, it provides the perfect setting for an unforgettable dining experience. The best of French and Austrian flavours, in a restaurant directed by 3-starred French chef Antoine Westermann who firmly intends it to become «The place to Be». Flirt with the Vienna horizon as you unwind after a day of work or touring, at Le LOFT Bar & Lounge. flamboyant cocktails and a large selection of fine wines from around the world. or order food and drinks for the business lounge. Sophis­ticated and chic, easy and relaxing. Sofitel InspiredMeetings concept guarantees a 5 star experience, from sales proposal to meeting room set-up. L’InspiredMeetings Planner becomes the sole interlocutor in charge of designing a tailor-made project and at the same time creating memorable experiences for participants. A made-to-measure service for exceptional meetings/ exceptional, inspired and inspiring. Nine adjustable meeting and conference rooms that can be adapted to suit individual needs are available, holding approximately 130 people. All have plenty of natural daylight and are provie the latest technology and state-of-the-art multimedia equipment and acoustic installations. The fitness area, So FIT, is equipped with Technogym fitness machines, cutting edge technology and design. Open 24 hours. Sofitel So SPA is inspired by a gastronomic French restaurant, menu, a domain in which the brand excels. The Starters, which last 30 minutes, are designed for active city dwellers in need of rest after a busy day. Main Courses and Desserts last for an hour and include body massages, facials, hot stone massages and other delights designed to nourish body and soul. So SPA is an oasis in the centre of the bustling city; stimulating the senses, this spa concept aims to regenerate mind and body. So SPA associates the traditional techniques and refinement of French cosmetics. For deep relaxation, original treatments eliminate tension and fatigue to create an invigorating and revitalising experience. Carita and Cinq Mondes have been selected as So SPA partners. Carita’s expertise based on constant innovation and a luxury approach to cosmetics is associated with the Cinq Mondes philosophy, which blends refinement with the best beauty and health traditions in the world. In around 750m2, the So SPA at the Sofitel Vienna Stephansdom has 5 private treatment rooms, a hammam, a panoramic sauna as well as a spa lounge ideal for relaxation with a breathtaking view of the Cathedral. So SPA also has its own range of treatments, So Exhilarating and So Rejuvenating, exclusive therapies augmented by Sofitel music played on So SPA iPods for a unique experience. All massage tables include a specially adapted version of the famous Sofitel MyBed concept, beds used in all the Sofitel Luxury Hotels, for maximum comfort and perfect relaxation. All public areas are completely non-smoking (including the restaurant and the bar). The hotel features 1 floor (total of 16 rooms) with smoking rooms. All the others are non smoking. Pets allowed (extra cost of 20€ per animal). Located in the heart of Vienna, Sofitel Vienna Stephansdom is an easy 15-minute ride from the Vienna airport via the City Airport Train (CAT). You can then explore the city by foot, bus, tram, underground, or boat. All main sights of Vienna are located within walking distance. 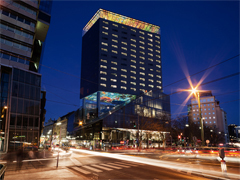 The hotel is situated next to the metro station "Schwedenplatz" (U1, U4) with easy access to the business district.